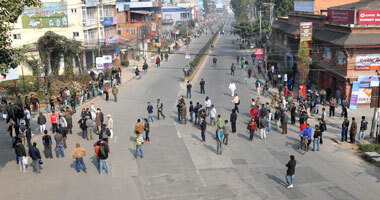 Lalitpur district today(December 5th) was closed down in protest of the murder of a gold entrepreneur. No transport means were run and colleges were operated in the morning. Hence, the office goers had to walk all the way to their destinations but there were private vehicles running though. Although the market was opened sparsely, shops in main cross roads were closed. The bandh was called under the initiative of the Nepal Gold and Silver Dealers Association, and the Lalitpur Chamber of Commerce and Industry. Gold entrepreneur Juju Kaji Bajracharya was killed by an unknown group Friday night. A protest rally was started from Mangalbajar. A valley bandh for Tuesday was announced but it has now been withdrawn.